Before talking about this alluring sloop we want to talk about the history of Southern Wind Shipyard. Operational for 15 years, certain features make it a special and interesting yard for any yachting enthusiast, especially for sailboat lovers. sail area: 424 sq. m.
systems development: Southern Wind Shipyard. For further information on the 100 DS and on other models currently offered by the yard (e.g. the SW82' DS, the SW72 o the SW80' FD) contact Southern Wind Shipyard Ltd, C/O Pegaso Yacht Division, Via Macaggi 25/21, 16121 Genoa - Italy; tel. 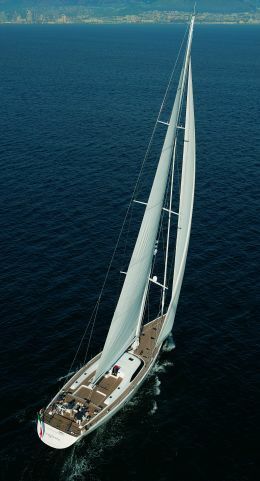 0039 010 5704035; fax 0039 010 5704065; email info@pegasoyd.com; website www.sws-yachts.com. Southern Wind, based in South Africa, is Guglielmo Persico's dream come true. After spending his youth in Naples, where he had close contact with the local shipyards, he graduated in engineering. His youthful experiences, specialised studies and a great passion for shipbuilding led him to the head of Cantieri Navali Rodriguez, a yard well known in the civil marine engineering field. But his passion has always been sail, and he took part, as he still does, in numerous races aboard his vessels. It was precisely his experiences as both technician and keen sailor that led him, over the years, to fine-tune his philosophy of the ideal boat, at least with regard to his own needs. But market demand has confirmed that it is a fairly widespread philosophy. 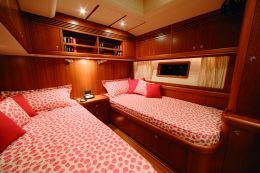 In 1990, having identified his ideal boat, Persico decided to entrust the design to Ron Holland, also bringing in his old friend architect Antonio Minniti, an interior design specialist. After purchasing the design he had to select a yard. On one of his many business trips he visited Cenmarine in Cape Town, a small yard specialised in custom yachts. One of this yard's strong points was an expert workforce who paid special attention to everything that was to be transformed from everyday object into sailing object. In a short space of time the yard found itself with two commissions: Persico's own boat Aga Jari and a 72 footer designed by Farr Yacht Design for a friend of his. Then came the decisive turning point. For personal reasons Cenmarine's owner decided to sell the yard, so Persico took over, buying new space, taking the workforce with him and setting up Southern Wind Shipyard. 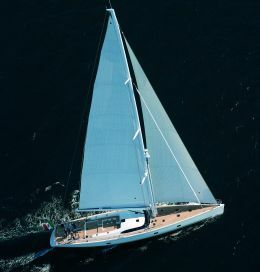 Aga Jari, for which an aluminium hull was envisaged, would never be completed but, in compensation, Farr's design immediately aroused the interest of enthusiasts, in particular because it was one of his first yachts which, though designed for performance, was also expressly intended for cruising. 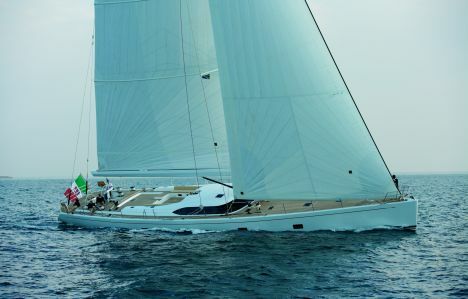 In the following years Southern Wind built no less than 10 examples of Farr's 72', years during which the yard concentrated on that type of yacht and the workforce increased from a handful of people to the 30 of today. Gradually taking on personnel from other yards, Southern Wind enriched its operational unit, which made it possible to create highly interesting boats that were greatly appreciated worldwide. As in the case of the 100 DS we're presenting here, the building of superyachts requires suitable space, so the yard had to continue buying areas where it could produce its creatures. 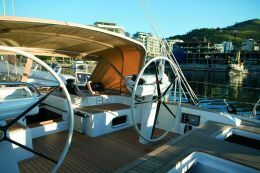 Incorporating sailing sector experts into the workforce the yard became increasingly skilled in building yachts that were exclusive in both performance and interiors. One fact that should certainly be mentioned is that Guglielmo Persico personally sails all the boats that Southern Wind builds. This in order to be sure that every model corresponds exactly to what an enthusiastic sailor wants of his sailboat. Now, after our brief history of Southern Wind, nobody will fail to understand that the 100 DS we're going to talk about carries within her the passion and experience of a chief who is involved daily in running the yard. Firstly, the boat is built in composites worked in accordance with advanced technologies, in particular in sandwich on a female mould using the infusion method, in a vacuum. Materials such as carbon, Kevlar mixed with glass, Core-cell and Divinycell are used to optimise mechanical resistance of the whole and to ideally handle the distribution of masses, with view to always ensuring maximum seaworthiness with high performances. On the 100 DS, as on all Southern Wind models, almost all the components are manufactured in-house, thus optimising each element in accordance with the requirements of each specific model. 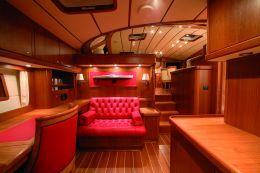 The cabinetmakers' work deserves special mention: they are excellent craftspeople and skilled in creating furnishing elements in line with a superyacht owner's expectations. 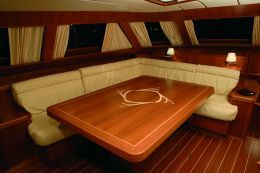 The 100 DS - DS stands for Deck Saloon - features a very clean deck with a deckhouse that is not very high. It houses the indoor saloon with dining and relaxation areas. The perimeter windows of the superstructure make it very bright and airy. From here you access, forward and aft, the owner's and guests' cabins. The shipyard offers two internal layouts which differ mainly in the positioning of the areas forward. One version has two spacious double bed cabins with a shared landing that includes an office corner; the other version has only one double bed cabin with an office and an adjacent study. 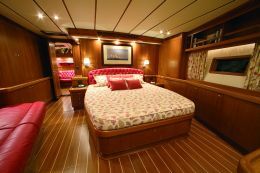 The zone aft, the same in both versions, consists of two double cabins which, like all the cabins on board, have a private bathroom, and the crew's quarters farther aft, with three cabins, crew mess, galley and relaxation area. 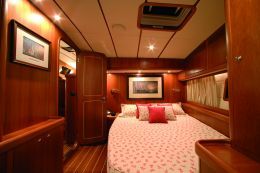 As we said, the deck plan of the 100 DS is very clean, designed to facilitate handling with a skeleton crew and at the same time provide suitable comfort for guests. Amidships there's a relaxation area with sofas round the perimeter on the extension of the superstructure, from which you can access the interior or proceed aft to the bridge where there are two complete steering stations. All the running rigging is led to the cockpit and handled by electro-hydraulic winches, so the helmsman has total control of the powerful sail plan on all points of sailing. This sloop rig consists of a mainmast in carbon by Nordic Mast, no less than 36.30 metres high, and three orders of crosstrees. The total sail area possible is 424 sq, m. which, together with the waterlines developed by Farr and a hull construction technology that ensures relatively reduced weights, guarantees high performances even in light winds. 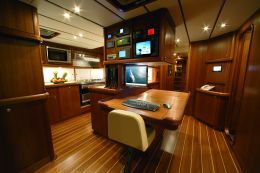 The engine room, which houses a 305 HP Cummins, is a spacious environment, very well designed to facilitate checking and handling of all the onboard systems it contains or whose controls are incorporated there. 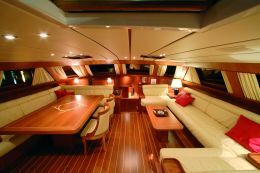 Indubitably a yacht built with maniacal care, as much in terms of the technical solutions as of the finely finished interiors which we had the pleasure to observe attentively with our own eyes. Farewell was exhibited at the Genoa Boat Show in October, having sailed there directly from Cape Town.